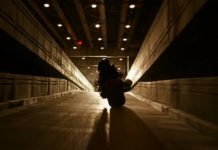 BOF Visits the Chicago Set of THE DARK KNIGHT! Back in 2004, I was invited to travel to the U.K. and visit the set of BATMAN BEGINS. Unfortunately, I was unable to attend and had to send my good friend Paul J. Wares as BOF‘s representative. While Paul did an outstanding job, I personally was disappointed that I could not attend. 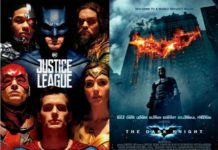 What Batman fan doesn’t want to visit the set of a Batman movie?! 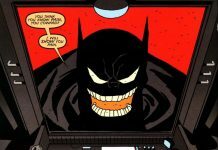 I swore to myself then and there if I had the honor of being invited to the set of another Batman film, I was going by gosh come hell or high water! 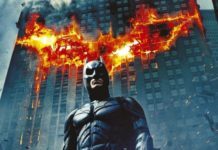 That day finally came some three years later in June of 2007 when I received an invitation to travel to Chicago and visit the set of the sequel to BATMAN BEGINS, THE DARK KNIGHT! I flew into The Windy City the day before the set visit was to take place. Having some free time, I walked around down Chicago and then took in some of the city’s music venues and watering holes that evening. 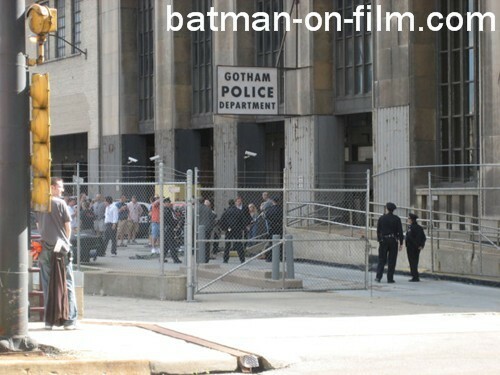 The actual visit to “Gotham City” took place on Friday, June 29, 2007 at a building known as the “Old Post Office.” The production of TDK had essentially taken over the place and turned it into a mini movie studio with filming taking place in and around the building. The group I was with — which consisted of about eight members of the press — was met by one of the film’s publicists who issued us security badges reading “RFK.” RFK = “Rory’s First Kiss” = The “secret” codename that everyone knew was really THE DARK KNIGHT. We then headed right into and through the building (Didn’t see all that much except a lot of construction) and quickly made our way to a large white tent that would serve as our temporary press headquarters. Once inside, we were greeted by large pictures of the Batpod, The Joker (That first released image of Heath Ledger as The Joker), and Batman. 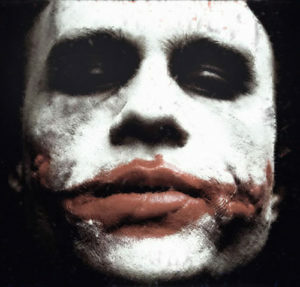 On mannequins were The Joker’s costume as well as the brand new Batsuit! I’ve got to tell you all that being able to examine these two items up close and in great detail was flat-out awesome! At that time, I had yet to see The Joker’s outfit and had no idea what it looked like. 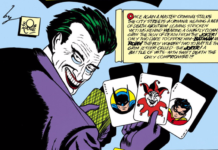 My first impression upon seeing the purple, pinstriped pants, green vest, purple overcoat, and the brownish (but very worn) shoes, I thought “Now THAT’S The Joker!” Even the crazy socks had “Joker” written all over them. The new Batsuit looks even better in person that any of the still images we’ve seen of it so far. It’s much sleeker than the BEGINS suit and is essentially a mesh body suit with “armor” attached on top. I’m looking forward to seeing the genesis of the suit in the film (Why does Batman need a new suit?) and it in action as well. 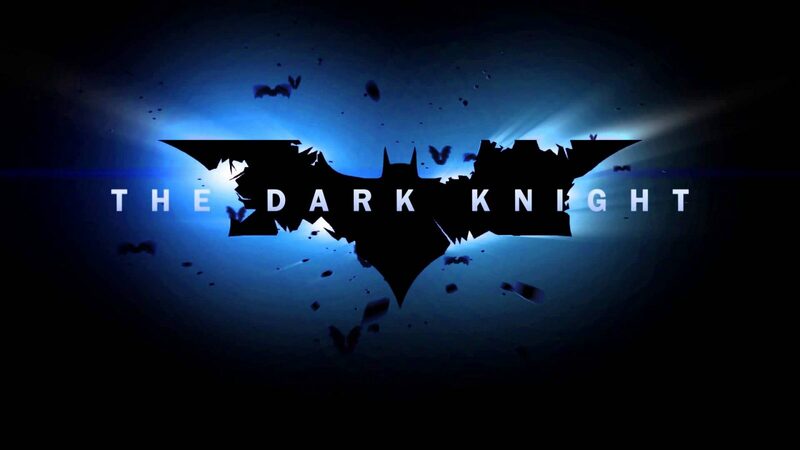 Also within the tent was a large flat screen TV with a live video feed of the TDK filming taking place that day. The video was on all day long — even during interviews — so we all were able to take in what was being filmed within the Old Post Office that day. I never realized how monotonous filming a movie can be! 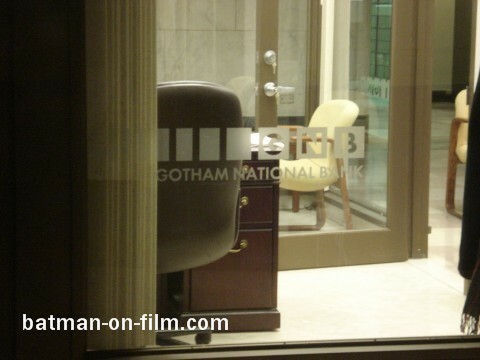 All morning long, a scene between Batman and Jim Gordon was being shot that was supposed be taking place within the vault of the Gotham National Bank. I swear, they shot that scene numerous times from different angles and with slightly different bits of dialogue. 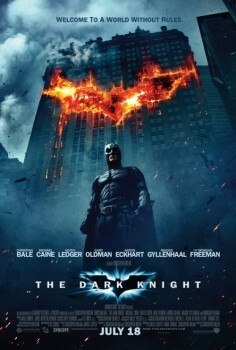 Sometimes it was shot with only Christian Bale as Batman, and then only with Gary Oldman’s Gordon. From what I’ve since gathered, this scene takes place right after the famous “Joker Bank Robbery” that was released in IMAX along with I AM LEGEND last December. 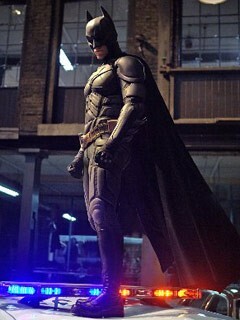 For one thing, Batman was sporting the BEGINS suit and not the new and not his new and improved getup. 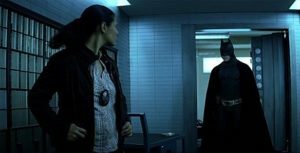 Secondly, we were told by the publicist that the scene was the first meeting between Gordon and Batman in THE DARK KNIGHT. Also involved in the scene were Det. Ramirez (Monique Curnen), a few members of the Gotham PD, and a dead Joker goon. 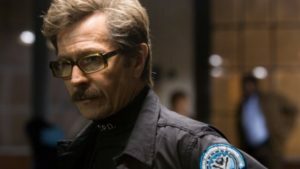 I should also mention that one the reasons that the scene went on as long as it did was because Gary Oldman kept dropping a stack of cash that Bale was throwing to him. It was funny as hell — and obviously everyone on set thought that too — because everyone would totally crack up each time Oldman dropped the money. In all fairness to Gary, he did finally catch the cash when it was thrown to him off camera by a set assistant. Oldman later joked that he did that to make sure the only good take of it was a close-up of him! Throughout the day, different members of the cast and crew would enter the tent and we’d get a chance to visit with them. Here are the folks we had the chance to talk to: Aaron Eckhart (“Harvey Dent“), Chris Nolan (director), Lindy Hemming (costume designer), Chris Courbold (F/X supervisor), Charles Roven (producer), Emma Thomas (producer), Graham Churchyard (Batsuit guru), Christian Bale (“Batman“), and Gary Oldman (“Jim Gordon“). At midday, we all went to lunch. Why is this important? Well, to get to the commissary tent, we had to go through the Old Post Office and were given a mini tour of the place. 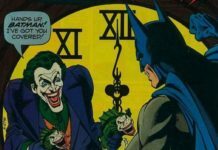 The Gotham National Bank where The Joker’s famous heist takes place? What was cool was that it was still set up to look like the bank robbery had just happened. There was glass shattered on the ground and police tape strewn about the place. We were also shown the wall where the school bus comes crashing through at the end of the Joker-led bank robbery. And the attention to detail! With the GNB deposit slips and ATMs, the place looked like an actual bank lobby. 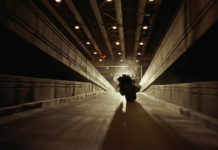 Before leaving the “bank,” we were allowed into the vault where the scene between Batman and Gordon being filmed that morning had been taking place. From what I gathered, they had taken are area that was once post office boxes and converted into a bank vault. Oh yeah, there was still a drill (I assume used in the bank robbery) and a Joker goon mask lying on the floor near the vault. At lunch (What a spread! ), we ate with all the extras and members of the TDK crew. It’s sort of weird eating amongst folks dressed up like Gotham police and SWAT officers. There was even one dude in a Batman costume — sans the cowl but still wearing the eye-black! The afternoon scenes took place in the bank vault and bank lobby that we’d visited before lunch. One involved Gordon and members of the Gotham SWAT team storming the bank vault — assumingly right after The Joker’s bank heist. Upon entering the vault, Gordon finds it empty — except for a few stacks of money seemingly put into a special pattern (by The Joker?). Gordon then yells, “It’s EMPTY!” and proceeds to kick the stacked cash. Before leaving the set after a nearly 10 hour visit, we went outside of the Old Post Office to witness a bit of filming in person. 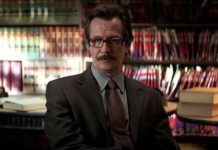 This must a been a big Gordon day because Gary Oldman again was front and center of this particular scene. Taking place right outside the GNB, Gordon drives up, gets out, and is immediately surrounded and questioned by various members of Gotham’s press. To me, this comes chronologically right before the aforementioned scene between Gordon and Det. Ramirez in the lobby of the GNB. After that, we all loaded back up on the bus and headed back to the hotel for dinner. Looking back, all I can say is “What a DAY!” As a Batman fan, it definitely was the highpoint of my fan life. When I started BOF ten years ago, visiting the set of a Batman movie was the furthest thing from my mind. Needless to say, it was truly an honor to be invited.